This trip weaves together China’s most famous icons. Walk an original section of the great wall and revel in the big show of Beijing. A city within a city of incredible scale and detail awaits, as well as serenely set palaces of sublime beauty and construction, and the full panoply of China’s people. A short high speed train ride away, in Xian, the famous Terracotta Warriors fascinate for their evocative detail, while a walk of the wider city finds us deep in the rarely seen exotica of the Muslim Quarter. The narrow streets, colourful markets and quiet mosques are surviving remnants of Silk Road caravan days. In Chengdu, observe the unique giant pandas in their struggle for survival. Relax on a Yangzi River cruise through the beautiful mountains above the Three Gorges dam, passing by picturesque rural villages still reliant on China’s most vibrant waterway. Travel to Yangshuo where the karst hills stand in the mist of Li River, serene and beatiful landscape immortalised by so many painters in generations. Shanghai’s bright lights, fevered trade and frenetic pace provide a glimpse into modern China and the dazzling global future and a palm sweating acrobatic show await for us here. 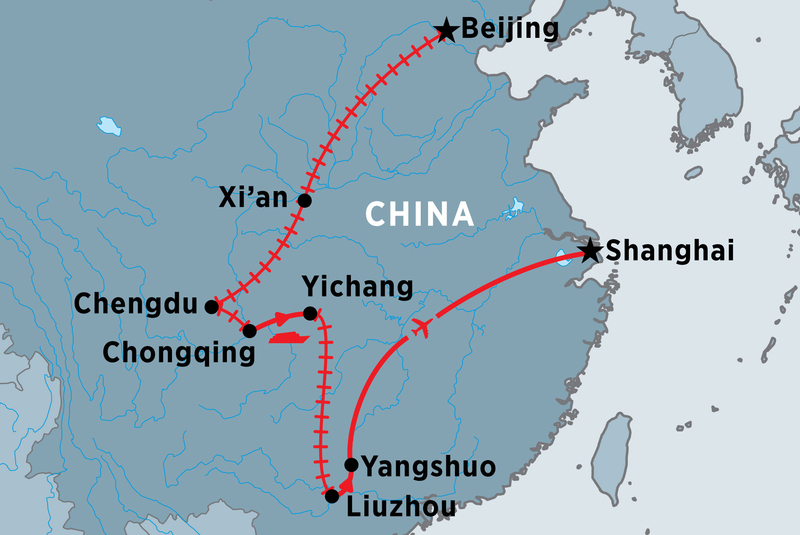 From 1st January 2019 this trip will be 17 days in length and begin in Beijing, finishing in Shanghai. It will also include Yangshuo.